Regular readers must find us horrible bores as we bang on about our wedding and honeymoon in Italy last year almost constantly. On our penultimate day of our three week trip, we raided an enormous supermarket in the suburbs of Montevarchi for the Tuscan products we cannot find or cannot afford here in NYC, and also, just for kicks, picked up a bottle of vin santo. Now, it’s very common — almost traditional, some would say — for the British, when visiting another European country, to buy a bottle or more of the local tipple as a souvenir. This tends to the eaux-de-vie / grappa-type firewater, often distilled with herbs from the surrounding hills, that the locals swear has health-restoring powers, but in fact is the cause of the blindness and insanity in endemic communities. And, just as commonly, once back in the UK, said bottle is placed in a dark recess of ones’ liquor cabinet and only ever reached for if, say England win something, anything, at football (soccer), and everything else in the house has already been drunk in the course of celebrating. Such was my thinking when we bought this curiously slim bottle of vin santo. Even when I learned that it was in fact a dessert wine and not a paint-stripper, I remained cautious. After all, during the 1990s and the early years of this century, dessert wines had consistently been given a bad rap. People looked down their noses at sweeter wines as dry, crisp wines like chardonnay were all the rage. My theory (based on no research at all) is that skinny southern Californians are to blame for this. You see, the 90s power lunch diet of a “dinner salad” sans bread, expensive mineral water, and glass of something dry and white seems to have persuaded the rest of us that not only was dry white wine somehow sophisticated, but it was also lower in calories than a sweeter wine, and therefore better for us. However, some recent actual research on the shelves of Gary’s Wines and Liquors (Flatbush Ave. and Sixth Ave., Brooklyn, NY) confirmed that wine stores which had previously been stocked almost exclusively with chardonnay, chenin blanc, and sauvignon blanc, are now burgeoning with viognier, gewurztraminer, albarino, riesling and several others whose names I forget. Clearly, there is some of sort of change in tastes afoot. Taking this research a step further, I also noticed sweeter dessert wines are appearing on menus in my neighborhood and amongst them, in at least one restaurant, I found vin santo. All of which convinced me to find out more about this unusual beverage and, hell, give it a try! Literally “holy wine”, vin santo is made from malvasia and trebbiano grapes that are left on the vine late to develop their sugars. The derivation of name vin santo is subject to some controversy since some believe that it had miraculous properties that cured plague in the 14th century. Others attribute it to a certain Greek Bishop who in the 15th century proclaimed upon drinking it “This is the wine of Xanthos!” — a pressed raisin wine from Santorini, which his fellow diners mistook for “santos”, i.e. “this is the wine of the saints”. Dismally though, it’s thought that the most likely derivation is its sometime use in Tuscany as a sacramental wine during mass. 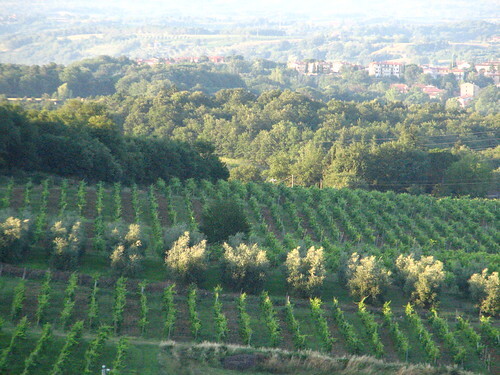 The third most planted grape in the world by area, trebbiano grapes have usually received a bad reputation because they (when unblended) tend to produce very rough and ready wines (mostly white, some red) that have usually only been drunk young as table wines. Some chianti producers use them as a blend with sangiovese grapes, but again due to their inherent instability, they are being phased out in favor of 100% sangiovese these days. Similarly, malvasia grapes are mostly used to make young and fairly rough white table wines, and are widely planted across the world too — most famously on the Portuguese island of Madeira where they are used to create the eponymous sweet wine. And, it is when trebbiano and malvasia are allowed to age that they become spectacular and display their real talents – both are commonly used as the base for other fortified wines like sherry, brandy and port. Once picked, vin santo makers allow their grapes to dry and develop even more sweetness as they hang from rafters in well-ventilated rooms until they are pressed. Then the sweet juice is extracted and placed into small, cigar-shaped barrels called caratelli. After an initial open-barrel fermentation, and in a similar method to aging balsamic vinegars, these barrels are sealed and then stored in garrets or attic spaces and left to age, the best for as long as ten years. It is because of this extended aging and sweetening process, as well as the deliciousness of the final product, that vin santo is so highly prized (and priced). It’s comparatively low yield per kilo of grapes picked and long production time means that not only is it a scarce commodity but it requires a lot of patience and care before it is ready. So, erm, what does it taste like? At the end of this 10 year period, the wine is a beautiful golden amber color with a slightly nutty flavor. It is certainly sweet but not in a honeyed or saccharine way. Rather, it has a perfectly balanced flavor that works wonderfully well at the end of a savory meal without completely coating the palate with sugar. Vin santo is typically served with almond or hazelnut biscotti-type biscuits/cookies (“cantucci e vin santo”) which are often dipped into the wine to soften them and accentuate their taste as a dessert combo, but it may be drunk as an accompaniment to other desserts or by itself as a digestive. However, and probably because of its sweetness, it is never served with cheese. Since first trying it and realizing that, like so many of my typically English preconceived notions about all things “foreign”, it’s actually very good and those “foreigners” know much better than the English when it comes to food, we’ve drunk it mostly by itself without biscotti. But you should get yourself some and drink it any which way you choose. Sadly, after squeezing as many small nips from it as we could manage to prolong its life, we have just finished the bottle we bought in Italy. Like many of the best things in life, you have to be sparing and savor it in order to get your money’s worth. Now, depending on where you live vin santo may be harder to find, but it’s easy to get hold of online, if a little expensive. So I encourage you to give it a try, perhaps at a restaurant first so your initial investment is limited, but I’m sure you’ll find, as I did, that re-evaluating ones prejudices towards sweet wines is a rewarding exercise. I haven’t tried it, but it sounds lovely! I have always loved high quality sweet wines.Give me a Hungarian Tokaj or Cnadian Ice Wine and I’m in heaven. I think every wine has its place. I hate it when people say I only drink red, or white, or dry, french, etc. It all goes with what your eating or not. I love wine! although i’m not huge into sweeter wine, this is in a class all by itself. and i NEVER tire of hearing the honeymoon tales. makes me smile. Yes, please keep the honeymoon tales coming – we all get to live vicariously through you! With all the lovely international photos and the food I often forget we live in the same city! I’ve yet to try vin santo, but it sounds like the perfect way to herald spring’s arrival. I also appreciate the mention of viognier – one of my faves! Sounds like this would have made the perfect accompaniment to the faux gras I made tonight. I just saw Mario Batali make biscotti (an old Molto Mario episode, not irl!) and he said his grandma used to dip hers in wine. Sounds like a perfect afternoon to me! That photo with the dog is too cute. I haven’t tried Vin Santo yet. Yeah, I love that picture too. Actually when I went to read what Jonny wrote in the post and I saw that picture I almost cried! It’s a picture of the property where we were married last sumer and that building is old and original and hasn’t been restored yet. We took a bunch of professional wedding pictures with those lovely pink walls in the background. The dog… pooba/puba/pupa – not sure how to spell it correctly – was the sweetest old thing and became like a member of the family throughout our wedding week on the property. In fact, he walked down the aisle in front of my sister-in-law bridesmaid at our wedding as if on cue – and it was completely not planned. it was the cutest thing. i’ll always have a deep soft spot for that dog and that picture! Nope, we never get tired of your beautiful honeymoon posts! We love seeing your pictures of Italy. We’re starting to experiment more with sweet wines and will add this one to our list. It sounds like to might do well with spicy Asian food too. Thanks! Wow, it’s been ages since having a good Vin Santo and I love your pictures. So rustic and beautiful. 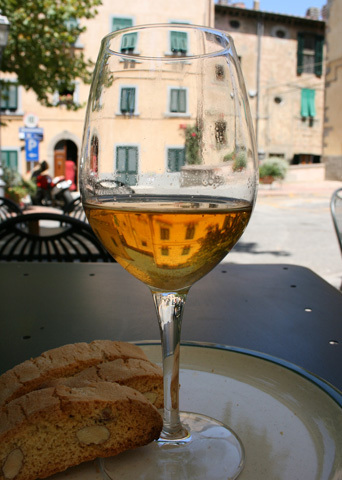 Hi- having spent a lot of time in Italy and much of it in Tuscany, I LOVED your post about vin santo. One of my favorite ways to end a meal is with cantucci and vin santo… I happen to have a bottle of some homemade by a friend’s uncle in Tuscany and I, too, am sipping it slowly and trying to make it last. It’s something so rustic and usually homemade and given as a gift, that I can’t see spending a lot on it in the US. I’ll wait til my next trip and smuggle some home! thanks for the reminder. ps: if you like dessert wines you should try moscato too! Great post on vin santo! I’m going to run, not walk, to the store to see if I can find this. BTW, I could never understand why more people didn’t like viognier, gewurztraminer, albarino, and riesling. These are my favorite whites. Thanks for all the great info on this! We love Vin Santo and always bring a bottle back (along with Lemoncello) when we’re in Italy. Lovely photos! Great photos & wonderful post on Vin Santo. Honestly, I love it that you mention your wedding in Italy so often…. Your OWN wedding should be the favorite one you ever attending. 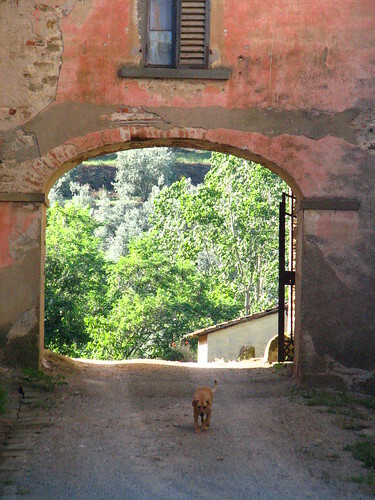 Alfredo & I were married in Civita di Bagnoregio almost 10 years ago and we never get tired of talking about it….. The best part is that that is just the beginning – you have so many more adventures ahead. I’m a student in the US, but I just recently returned from studying in Tuscany. I’d never been a fan of wines before, but I absolutely fell in love with Vin Santo while there. I returned with a decently high quality bottle and have been savoring nips from it with dinner since then. As soon as I finish this bottle I will definitely be looking for another. when i was in tuscany i could not get a bottle of vin santo, only by the glass, that was in 2006.
we were on our way down to rome, stopped off at a shop lke a seven-eleven and bought a bottle of vin santo for under 10 euros. in australia the prices of vin santo start at $14.00, and they imported from italy – tuscany i hope. they do have the best holy wine or i call it sainted wine. to all my italian readers – saluti a tutti. i left a reply already. Just add the i could not get the vin santo in a bootle from tuscany while there, only bythe glass, that was in 2006.
on our way down to rome bought a bottle of vin santo for under 10 euros. In australia the prices start as litle as $14.00, so i say what a bargain. i just hope the sainted wine of holy wine was imported from tuscany, which i’m pretty sure it was. the best vin santo comes from the tuscany region. Hey, Anna! 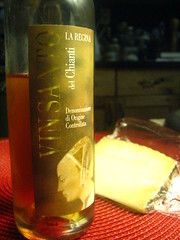 We found this bottle of vin santo in a small grocery store somewhere in tuscany. Yes, it’s tuscan and bought in tuscany. and it cost about 6 or 7 euros!! i wish we brought a whole case home. but we did just find 2 bottles of imported vin santo in our wine store but they just arrived recently. it really is a beautiful tasting thing and i think i’m going to try one of the ones from the store to see what i think! thanks for the comment – please stop by to see us again! Once again guys, nice write up on Vin Santo. This is a Marsala like wine elevated in a good way. Substitute Marsala with Vin Santo on Chiken Marasala and Veal Marsala recipes, mamma mia! My favorite is sauted wild mushrooms with Vin Santo, butter and parsley sauce, pure heaven.